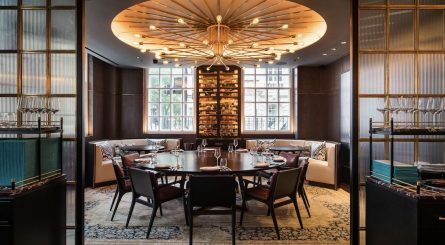 Private dining rooms in Mayfair provide a discrete environment for business meetings as well as both private and corporate lunches & dinners. Mayfair is home to grand architecture, elegant squares and fine parks as well as being the location for some of London’s most exclusive shops. The stamping ground of the rich and influential, Mayfair is bordered by Regent Street, Oxford Street, Piccadilly and Hyde Park and provides a superb range of restaurants and hotels offering a broad mix of cuisine. Mayfair is well served by the London underground and can be reached by traveling to tube stations including Green Park, Bond Street, Piccadilly Circus and Hyde Park. 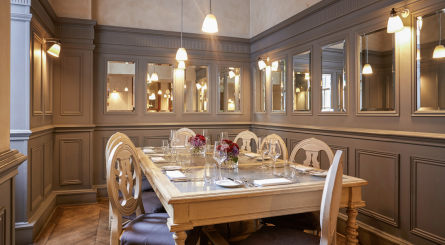 If you are looking for for a private dining room in Mayfair, at www.privatediningrooms.co.uk we offer a great range of dining rooms available to hire for private lunches and dinner events. 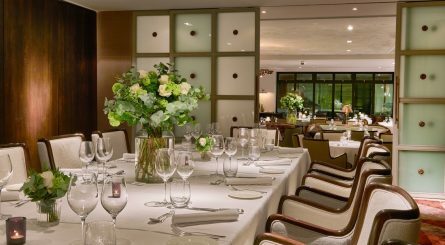 The private dining room at The May Fair Hotel seats 10 – 50 guests. Larger private rooms for banqueting events seat 170 – 220 guests. 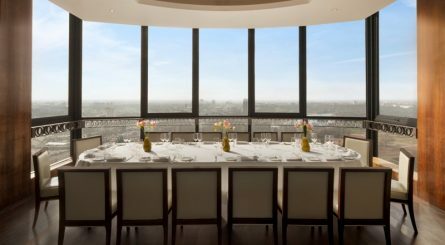 With breathtaking views of the London skyline, The Balcony private dining room at Galvin at Windows is located on the 28th floor of the Hilton Park Lane and seats 16 – 30 guests. 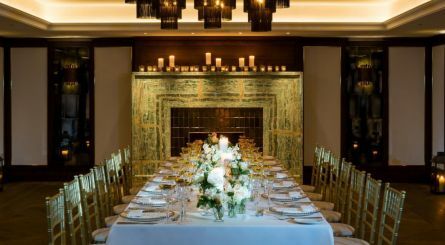 The elegant private dining room at Rüya modern Turkish restaurant in the heart of Mayfair W1 seats up to 15 guests on one round table or alternatively 20 guests on two round tables of 10 people per table. Restaurant exclusive hire also available for up to 120 seated guests. Gymkhana is an acclaimed contemporary Indian restaurant in the heart of Mayfair. Private dining spaces at Gymkhana include two vaults with banquette seating for 10 – 12 guests. The lower ground floor is available for semi-exclusive hire for up to 45 seated guests. Restaurant exclusive hire for up to 90 guests. China Tang has three private dining rooms seating 18 – 80 guests. Exclusive restaurant hire available for up to 150 seated (200 standing) guests. 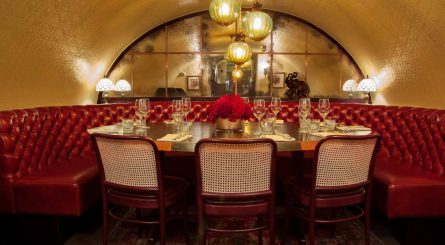 The downstairs private dining room at Aubaine in Mayfair can accommodate up to 27 guests or up to 35 for standing receptions. 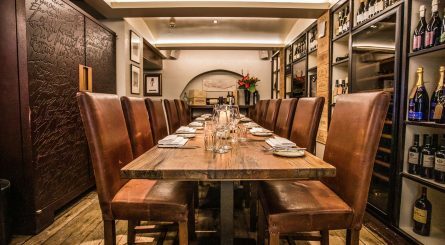 Private dining rooms at Mews of Mayfair accommodate 14 – 28 seated guests and are also available for standing drinks receptions of 25 – 35 guests. Exclusive hire of The Brasserie is also available for up to 70 seated guests. 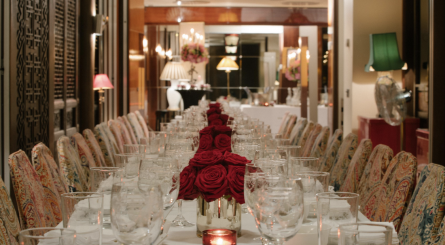 Sartoria in Savile Row has two elegant private dining rooms; both seating up to 25 guests or up to 50 when combined. 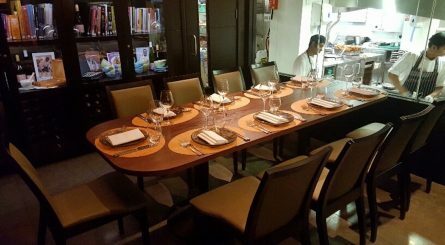 For more intimate private dining events, The Wine Room seats up to 6 guests. 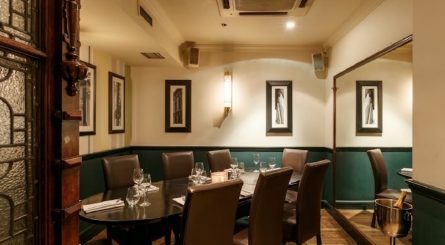 Browns Mayfair has three private dining rooms respectively seating up to 4, 20 & 40 guests & is available for exclusive hire for up to 72 seated / 100 standing guests.